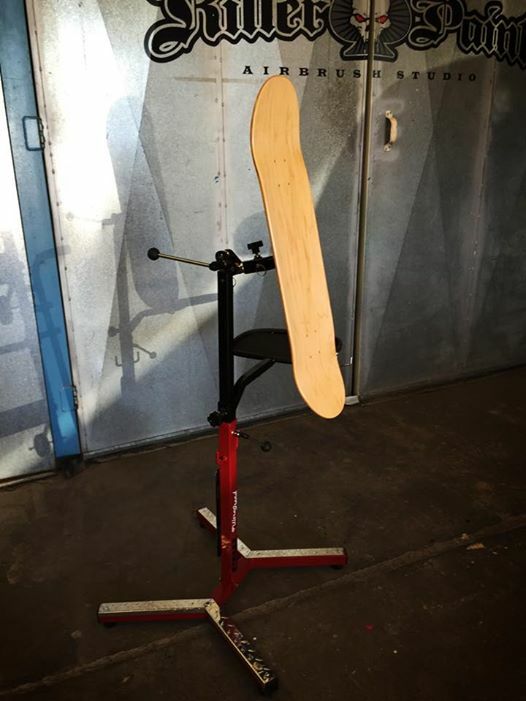 When painting helmets, motorcycle parts, car parts or any number of other items that come by the shop, it is usually necessary to use some kind of stand or mount to put them on when working on them. 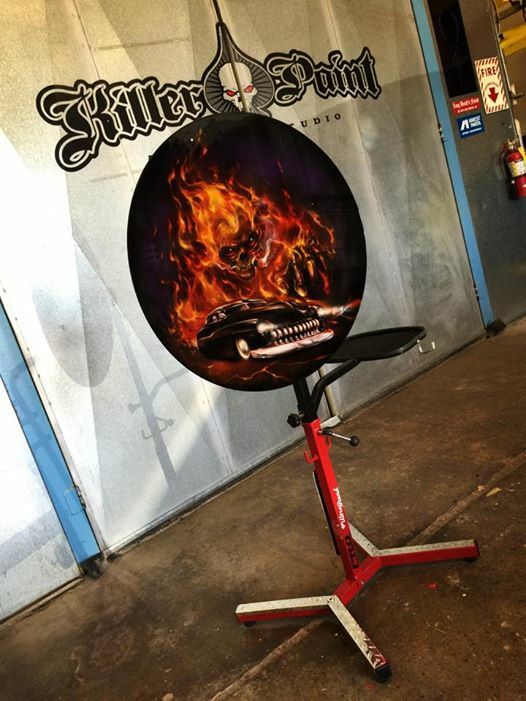 For years here at Killer Paint we have used any number of methods, from homemade stands to improvised or re-purposed equipment, (even the occasional spare box) to keep items steady during a project. 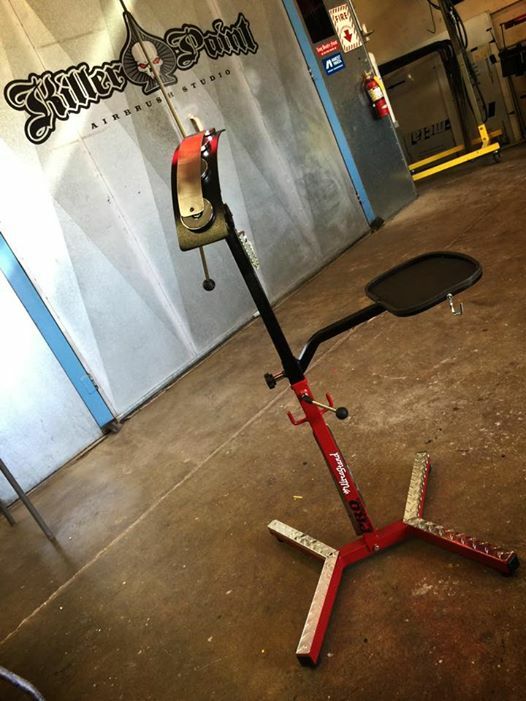 Recently, Mike discovered a company that builds parts stands specifically tailored to the needs of the custom paint trade, called UltraStands. Now their products are standard equipment in our shop, holding many of our projects securely in place while they are being worked on, and we wanted to give them a shout out to let them know how much we use their product. These stands are designed to be highly adjustable. They can be easily raised and lowered, pivoted and tilted, as well as rotated a full 360º so that you can work on a project at the angles or positions you need, with minimal fuss or effort. Equally important, is that they are ruggedly built with heavy gauge steel, and are very sturdy. There are standing floor models, as well as table clamp-mounted versions. One of the great features of the UltraStands is that there are a wide variety of specialized attachments, designed specifically to hold the kinds of items that regularly come into a paint shop. For instance, there are curved mounts that magnetically hold most metal motorcycle fenders, mounts that will hold most helmets upright and stable, and solutions for large parts like automobile hoods. They are highly customizable, and are available with different options to suit many needs. New configurations and attachments are being developed regularly, and we are excited to see many of the items they will release as the UltraStand product line grows. If you would like to visit the UltraStand Facebook Page, they post regular updates on their newest innovations and attachments. There are many additional photos there of the wide range of products and the different way they are used to keep project pieces in place, hassle free. There are also a handful of videos demonstrating some product features here.